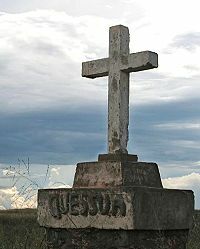 Called by many the heart of Methodism in Angola, Quéssua was an important center for education where missionaries from the United States taught and served for almost a century. It included a church, a clinic, and different schools covering from elementary to secondary education, theology and a school of agriculture. Then came a long and cruel civil war that lasted from 1975 till 2002. In 1992 Quéssua was bombed down in an act of revenge against the first president of Angola, Agostino Neto, who was a United Methodist. For a decade the place remained a ghost town. Following the war, the Annual Conference of East Angola partnered with government institutions, United Methodist Conferences in the US, and individuals who were educated at Quéssua, in order to rebuild the compound. In 2002, Bishop Timothy and Mrs. Melba Whitaker, from the Florida Conference, visited with Bishop José Quipungo, resident Bishop of East Angola. This was the beginning of a growing partnership that is bringing together hands and resources from the two conferences. At present, the Church, Elementary School, High School, School of Theology, a dorm for students, and several houses for professors and missionaries, are already repaired and in operation. The government also repaired and is running the Institute of Agriculture. Now that we have moved to Quéssua, we constantly hear words of genuine appreciation for the assistance of the Florida Conference. Angolans feel that the excellent work performed by U.S. missionaries until 1975 is beginning to return. During the colonial occupation, the Portuguese authorities only allowed Angolans to pursue education up to the fourth grade. The work of missionaries, who often ran into confrontation with the authorities, made it possible for many Angolans to reach higher education. Now Quéssua is not only a renewed source of education but also a beacon of hope for the people of the East Angola Conference. Today we had the opportunity to tour Quéssua guided by Bishop Quipungo. There were sparks in his eyes as he showed us the ongoing reconstruction at different sites. Heavy machinery working on the roads often overpowered his voice. Today we begin a series of blogs on Quessua so that you can also get a glimpse of the new life here. You will be inspired by the glorious past and promising future of this blessed land.